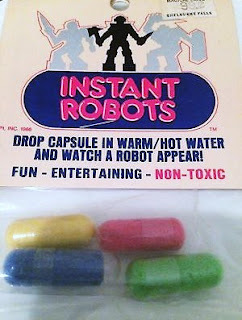 Back in the late '80s and early '90s, a trip to the pharmacy often resulted in getting to pick out a package of Magic Grow capsules...you know, the little colorful pill-shaped things you dropped in water that would dissolve after a minute to reveal a sponge in the shape of something. Sometimes these came carded and sometimes they came in a little bag with a cardboard header. I remember certain ones were just called "Instant" followed by whatever the subject matter was (like "Instant Circus" or "Instant Robots"). 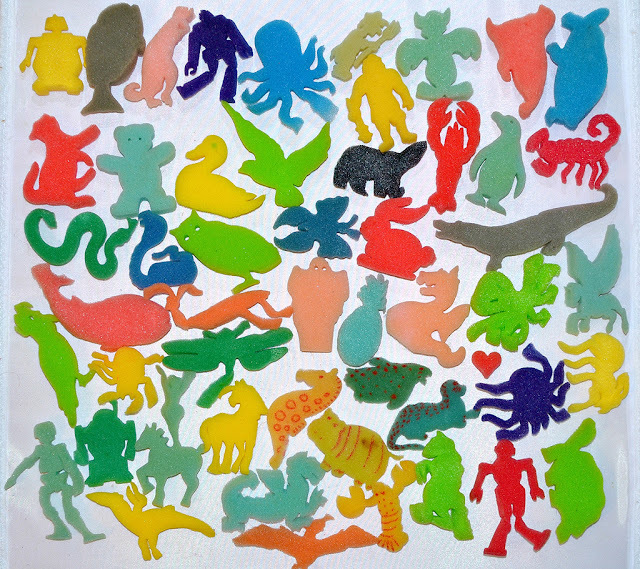 They were cheap, they were (sort of) educational and they provided a way to keep young'uns focused on something for a few minutes, so I'm guessing a lot of other kids used to go home with these after a trip to the store with their parents, too. I remember my Mom used to keep old Cool Whip tubs specifically for capsule dissolving purposes. For some reason I kept all of mine, shown here. Most survived the decades surprisingly well. Only a few corroded and had to be tossed. I'd guess these are all from about 1988-1992. My favorites, of course, are the dragons, monsters and robots. Also noteworthy are a few animals that had painted details, which you didn't see very often. I remember as a kid seeing Greek mythology-themed ones advertised on the back of a package and searching for them for a long time, but never finding them. I think these can still be found in some form or another at dollar stores and such, but probably not in as many different varieties. Seeing them always results in a major nostalgia attack. What about you? Do you have any Magic Grow memories? Nice! Whenever I see any in the store these days I'm tempted to buy some to dissolve just for the nostalgic value. Oh...and it's very impressive that you've managed to hold onto these since your childhood. I'm impressed that they've lasted on a shelf in our lab without anyone throwing them away. Nice post. Quite a few years ago (2001/2'ish?) I reviewed these for Plastic Warrior magazine, having come across them at the January Toy Fair in London. I don't think they got them past the Health & Safety people due to the 1 an a million chance of chokeing on a piece of expanding sponge! The Irony being that I believe the same logic makes it hard to get Kinder your side of the pond! If I offer to transatlantically swap sponge toys for Kinder - will both parties be smugglers in the eyes of the law? Thanks! Really? These have been sold here for decades without issue, I think. I still find it crazy how Kinder eggs were classified as so dangerous here but seemingly much more dangerous items marketed to kids are allowed. I'm collecting some but all i can get are the magic capsule creatures i really want to try and get the ones i've never seen before like the monsters,dragons and mythical creatures.